We all know Christmas is less than a month away but there is still time to find your perfect Christmas looks for the parties, shopping, and social events on your calendars!! This year there are so many great Pinup outfits from dresses to separates and even casual attire available. Many of my readers are newbies when it comes to Pinup and many are long time devotees but, I have heard from so many of you that you are not finding the perfect outfits for the holiday season so I have put together this guide I am calling Novelty Christmas Pinup Wear in the hopes it helps out all my Pinup friends and even those who have a Pinup in their life and are looking for perfect gifts!! Yes, I am kitsch obsessed and the more novelty the item is the more I have to have it. Nothing screams Christmas like a good novelty print!! These are some amazing novelty pieces available this year ranging from skirts and dresses to fun tops and accessories. 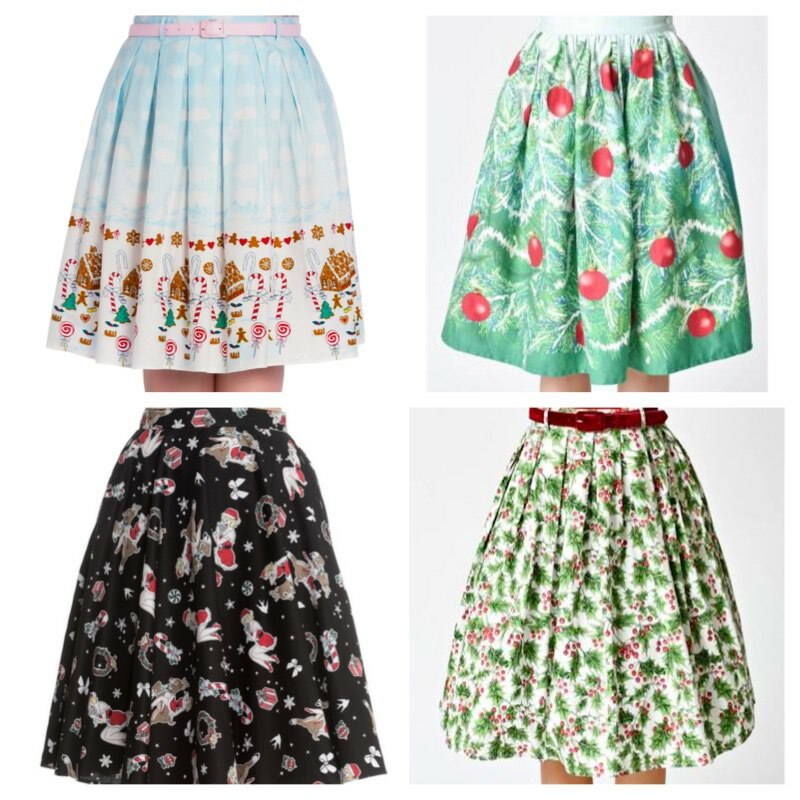 Novelty Skirts: Right off the bat we are going to start with Christmas novelty skirts. Look how GORGEOUS and fabulous these are!! Pinup Girl Clothing has just released their amazing Ornament Collection pictured in this post (above). You can find other styles in the ornament print on the website. These are available for pre-order and already starting to sell out. 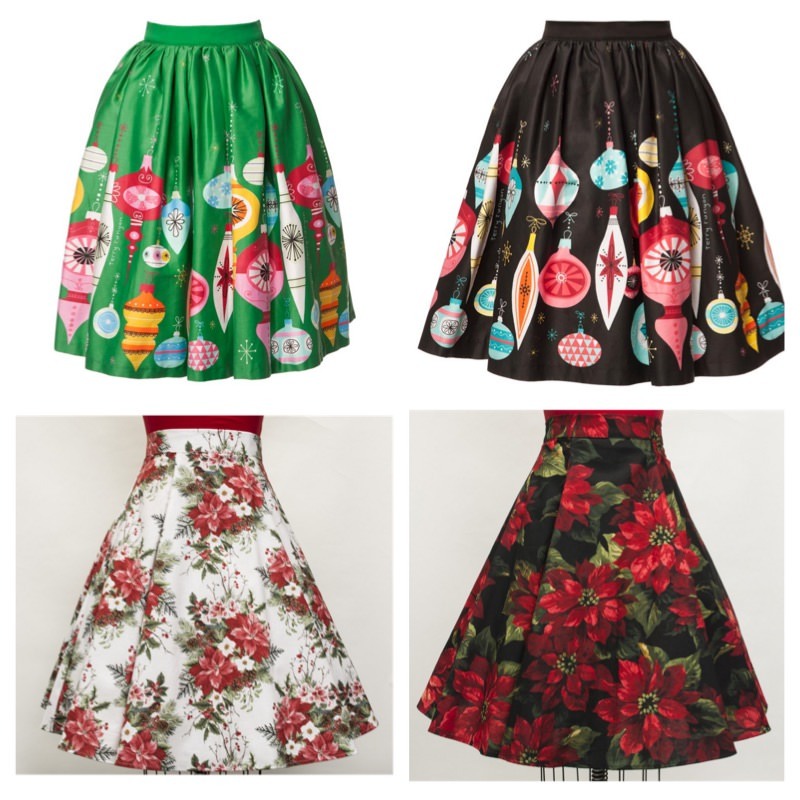 Other amazing novelty skirts are from Hell Bunny (pictured below) who never disappoints with their clothing and then we have one of my favorites Heart of Haute who designs the most elegant clothing and you can see how detailed the print is in the Holiday Bouquet and Poinsettia twirl skirts in this post (pictured above). Harlequin, it is quintessential kitsch, vintage and mid-century modern and it screams Christmas when done in red, green and white. This Holiday Harlequin corset skirt print is also from Pinup Girl as is the Holiday Harlequin Sabrina top and recently restocked but it is selling out fast (and you might just see me too amongst the models) and is the opening picture to this post. For even more novelty print skirts Hell Bunny has come out with many and they also have dresses in many of these prints. The Gigi candy cane gingerbread skirt is so sweet as is the Holly Berry skirt and you can also find these plus the red ornament skirt at Unique Vintage too. 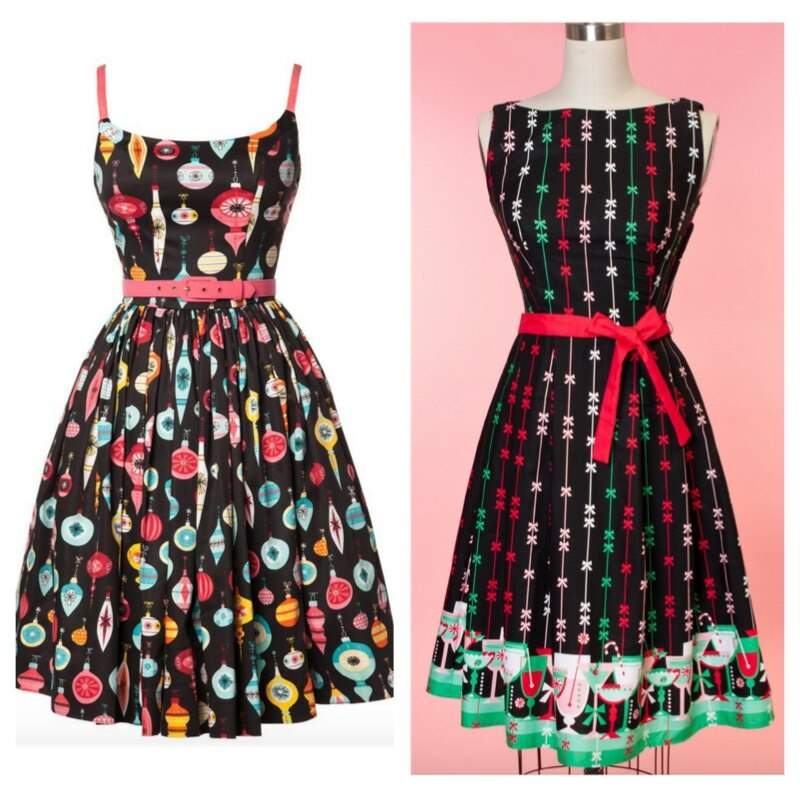 Novelty Dresses: Pigtails and Pirates is one of my favorite brands and they have two spectacular dresses with such festive prints. The dresses are so easy to wear and style. Add a petticoat for added fluff. 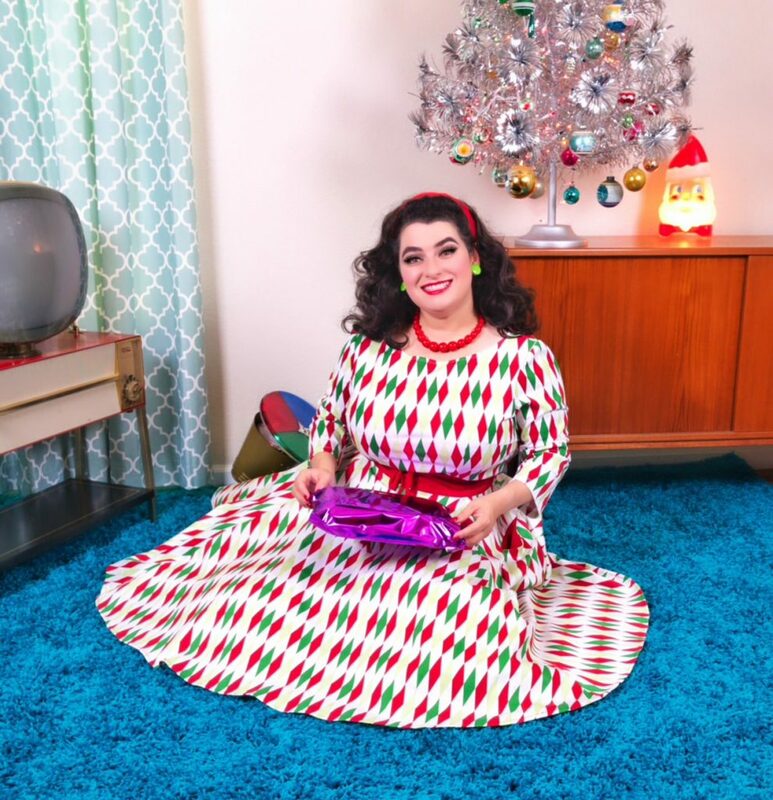 The Christmas Elves dress is so festive and colorful and fits like a dream especially on a curvy body. The ‘Tis the Season’ dress also fits perfectly and the print is all Christmas and winter with snowmen, ornaments, presents, Christmas trees and more. You’ll love these!! 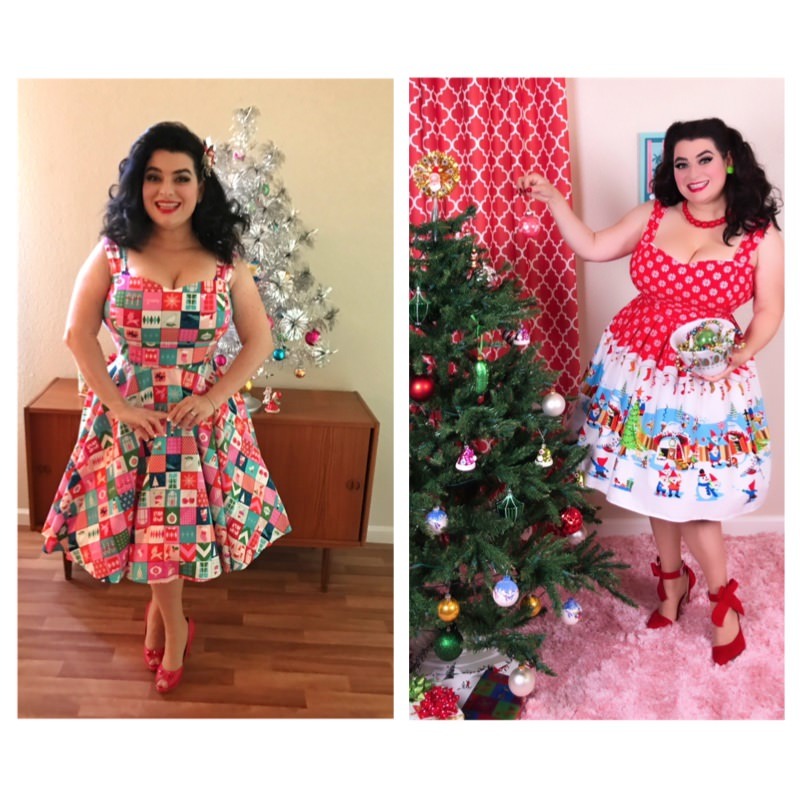 I am also featuring two additional dresses in this post and one is called Jenny from Pinup Girl Clothing in the new ornament print and the other festive dress is the Monica dress in Holiday Cheer print from Hart of Haute. 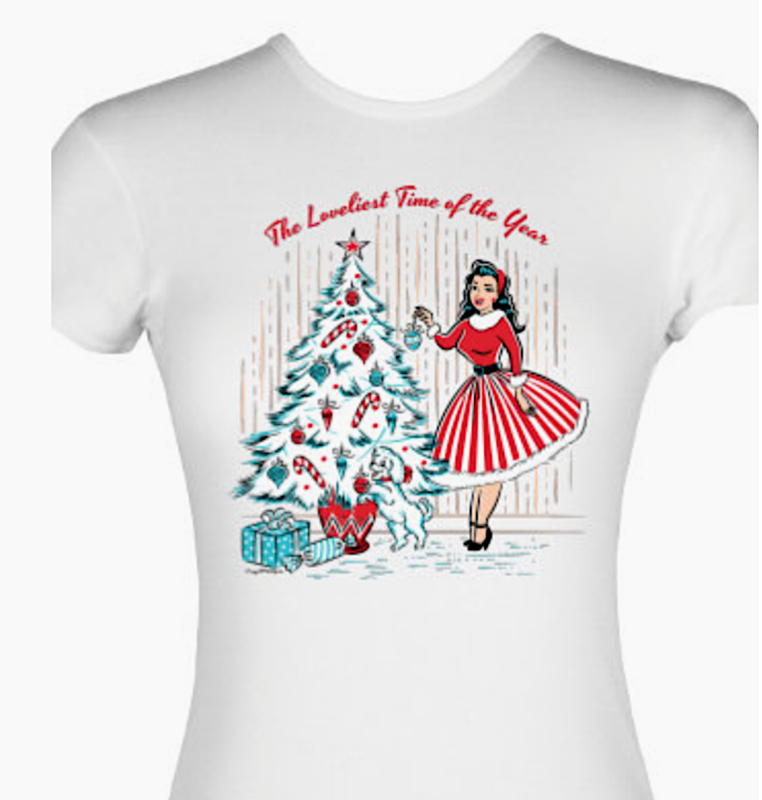 Novelty T-Shirt: If you want to be a bit more casual this season then I have the perfect t-shirt for you and it is my novelty Pinup Girl Decorating Christmas Tree print tee from Crazy4Me Style…. It can easily be dressed up or down!! Novelty Purses: And look at these purses!! Betsey Johnson never disappoints when it comes to Christmas. 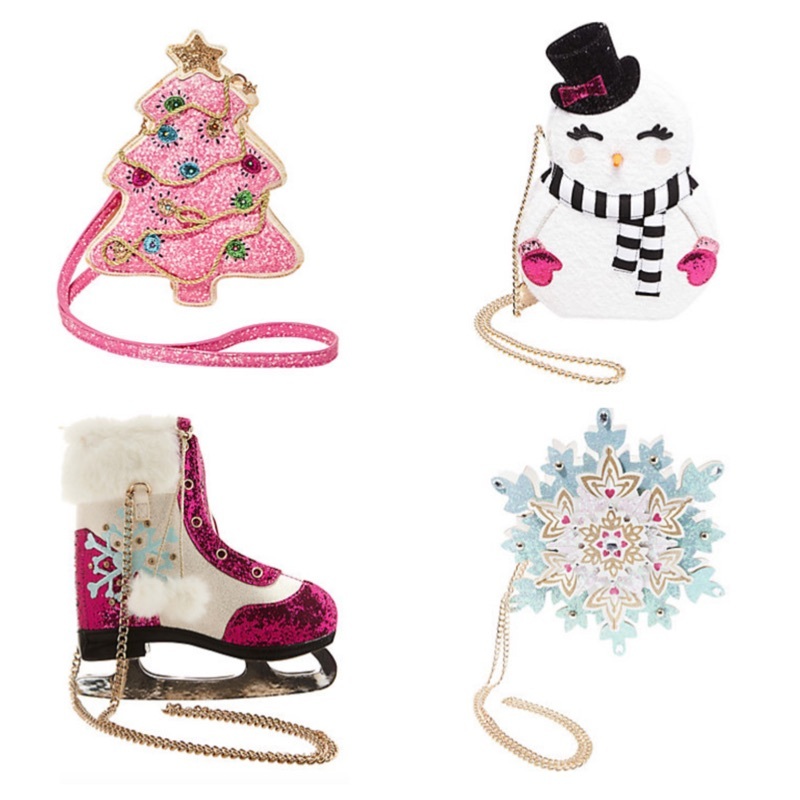 These novelty purses are incredible with so much details and festiveness. The pink tree is on my list!! All of the items listed in my guide also make perfect gifts for the Pinup or vintage Doll in your life! !